As Warner Bros prepares to release the latest Harry Potter movie, Harry Potter And The Order Of The Pheonix, ITV gives viewers some fantastic programmes to gen up on all the magic behind the scenes. 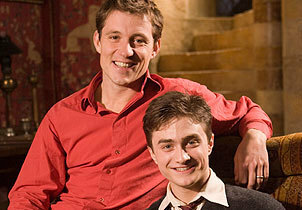 In early July there will be two TV specials, presented by Ben Shephard, as well as a screening of the movie in which the magic all began, Harry Potter: The Philosopher's Stone. In Harry Potter: Behind The Magic Ben goes behind-the-scenes of the global phenomenon to reveal just what went into making the new film. There are exclusive chats with cast members including Evanna Lynch who plays new character Luna Lovegood; Imelda Staunton who plays Professor Umbridge and Daniel Radcliffe talks about Harry’s first screen kiss opposite Katie Leung who plays Cho Chang. Viewers will also enjoy on-set visits to Harry’s childhood home, Privet Drive, the Gryffindor Common Room, as well as brand new sets for this film inlcuding Number 12 Grimmauld Place and the Ministry of Magic. In Harry Potter: The Costume Drama Ben goes behind-the-scenes on set of the most elaborate Harry Potter movie so far and delves into the wizards’ wardrobes to find out just how the amazing, intricate costumes come to life. Each character’s costume is integral to their performance in the film, the intricate details ensuring that JK Rowling’s fantastic stories come to life on the big screen. Rupert Grint discusses the apparently unassuming clothes he wears as Ron Weasley. And new character, Professor Dolores Umbridge (Imelda Staunton) explains why she's in the pink. And there's a word from the most evil of evil himself - Lord Voldemort (Ralph Fiennes). Find out more at ITV.com.